Konev said, "The surface is gathering us in." Dezhnev nodded. "It looks like its doing this." He held up his thick and callused hand, cupping it. "Exactly," said Konev. " It will invaginate, make a deeper and deeper cup, narrowing the neck and finally closing it, and we will be inside the cell." He seemed quite calm about it. So was Morrison. They wanted to be inside the cell and this was the way it was done. The receptors continued coming together, alongside each one of them some molecule - some real molecule - and in among them the feigning molecule of the ship. The cell's surface, like Dezhnev's cupped hand, closed upon them entirely and drew them in. Dim objects to either side loomed up ahead, drifted to one side, left or right, and fell behind. Ribosomes? Golgi apparatus? Fibrils of one sort or another? Morrison could not tell. From the vantage point of small molecule size, nothing, not even the sharpest, most familiar intracellular object, would look familiar, let alone recognizable. As many of you probably know, Isaac Asimov wrote the novelization of the 1966 Racquel Welch movie Fantastic Voyage. Asimov was apparently unsatisfied with the poor science in the story, which he was unable to change because it was central to the movie. So what he did was write a new novel in 1987 - Fantastic Voyage II: Destination Brain - which isn't really a sequel, but is rather a new story with a similar plot. I recently found a copy of FVII:DB at my local library's book sale and found it pretty entertaining. Asimov does his best to create a plausible scientific basis for the miniaturization technology and the descriptions of the miniaturized sub exploring the brain are pretty good. It's not perfect - characterization isn't really Asimov's strong suit, particularly of female characters, and the story has a disappointingly psi-based ending - but it was certainly worth far more in entertainment value than the 50 cents I paid for it. 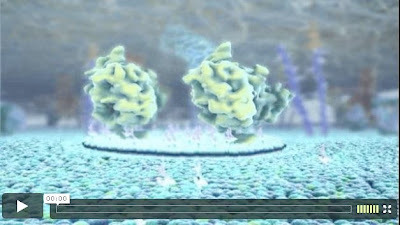 Watch XVIVO's Inner Life of the Cell - blow it up to full screen size for the best effect. There is a narrated version that explains what you are seeing (but isn't quite so high resolution) on Harvard's BioVisions web site. We had to figure out how to take a cell that is so packed with molecules and to edit out visually about 90 to 95 percent of those molecules and still keep in all the kinds of structure that would indicate to the student what’s going on. The reality is that there isn't much space in there for maneuvering, even if you are traveling in a submarine the size of a glucose molecule. To get a sense of scale of the cells and cellular structures, check out the interactive "Cell Size and Scale" graphic at the University of Utah's Learn Genetics site. I actually read that book years ago. It was an abitious attempt, but got so bogged down in the details that it lost some of it's entertainment value. Still, a bold attempt. I have used this novel for years in my undergraduate cell biology course, because Asimov made some tragic technical errors in his narrative. In Chapter 58, he describes the structure of a phospholipid bilayer membrane, yet describes a model of membrane structure that was debunked after 1972: "...receptors and proteins to which they were attached seemed to be swimming through the phospholipid molecules (with a film of cholesterol underneath, Morrison knew)." Apparently Morrison was absent the day his cell biology class learned that cholesterol molecules are oriented parallel to the phospholipid fatty acid chains, and not in a film between the two leaflets of the bilayer membrane, as postulated in the 1950's. The other egregious error evident in chapters 58 and 59 is the description of glucose entering a cell through receptor-mediated endocytosis. This process much too slow and inefficient to get small solutes across the cell membrane. Asimov completely ignored faciltated glucose transport through permease molecules. Iaaronson: Thanks for pointing out those mistakes. I totally missed the mention cholesterol when I was reading it. Asimov must have been referring to an outdated textbook. I actually like that the ship got into the cell by receptor mediated endocytosis, even if would be too slow for glucose transport, for its dramatic value. I did, and I thin a Cameron "Fantastic Voyage" has the potential to at least look spectacular. It's hard to know if the plot would be any better than the original movie.